Online Coaching / Programming for Nutrition and Workouts!!! A native Lexingtonian and a 2003 Graduate of the University of KY Jamie is passionate about helping people in the Bluegrass achieve better health and fitness. 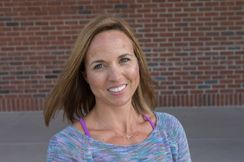 She first obtained her certification from the NSCA in 2006 and her ACE Health Coaching Certification in 2015 however; her passion for health & fitness began in early childhood and has grown ever since. After becoming a mother in 2005 she began to value and better understands the importance of nutrition, mindfulness, and balance to improve overall health and wellness. Jamie believes that all of these things when in balance positively impacts our careers, families, lifestyle, and quality of life. Her mission is to guide her clients on their journey by meeting them where they are and understanding their lifestyle to develop sustainable change. She finds coaching them in proper exercise & body awareness, nutrition modification, and stress management improves confidence and creates a positive self-image; all of which generally lead to better health and improved body composition.